Fat Charlie Nancy's normal life ended the moment his father dropped dead on a Florida karaoke stage. Charlie didn't know his dad was a god. And he never knew he had a brother. Now brother Spider's on his doorstep-about to make Fat Charlie's life more interesting . . . and a lot more dangerous. Fat Charlie was only ever fat for a handful of years, from shortly before the age of ten, which was when his mother announced to the world that if there was one thing she was over and done with (and if the gentleman in question had any argument with it he could just stick it you know where) it was her marriage to that elderly goat that she had made the unfortunate mistake of marrying and she would be leaving in the morning for somewhere a long way away and he had better not try to follow, to the age of fourteen, when Fat Charlie grew a bit and exercised a little more. He was not fat. Truth to tell, he was not really even chubby, simply slightly soft-looking around the edges. But the name Fat Charlie clung to him, like chewing gum to the sole of a tennis shoe. He would introduce himself as Charles or, in his early twenties, Chaz, or, in writing, as C. Nancy, but it was no use: the name would creep in, infiltrating the new part of his life just as cockroaches invade the cracks and the world behind the fridge in a new kitchen, and like it or not -- and he didn't -- he would be Fat Charlie again. It was, he knew, irrationally, because his father had given him thenickname, and when his father gave things names, they stuck. There was a dog who had lived in the house across the way, in the Florida street on which Fat Charlie had grown up. It was a chestnut-colored boxer, long-legged and pointy-eared with a face that looked like the beast had, as a puppy, run face-first into a wall. Its head was raised, its tail nub erect. It was, unmistakably, an aristocrat amongst canines. It had entered dog shows. It had rosettes for Best of Breed and for Best in Class and even one rosette marked Best in Show. This dog rejoiced in the name of Campbell's Macinrory Arbuthnot the Seventh, and its owners, when they were feeling familiar, called it Kai. This lasted until the day that Fat Charlie's father, sitting out on their dilapidated porch swing, sipping his beer, noticed the dog as it ambled back and forth across the neighbor's yard, on a leash that ran from a palm tree to a fence post. "Hell of a goofy dog,"said Fat Charlie's father. "Like that friend of Donald Duck's. Hey Goofy." And what once had been Best in Show suddenly slipped and shifted. For Fat Charlie, it was as if he saw the dog through his father's eyes, and darned if he wasn't a pretty goofy dog, all things considered. Almost rubbery. It didn't take long for the name to spread up and down the street.Campbell's Macinrory Arbuthnot the Seventh's owners struggled with it, but they might as well have stood their ground and argued with a hurricane. Total strangers would pat the once proud boxer's head, and say, "Hello, Goofy. How's a boy?" The dog's owners stopped entering him in dog shows soon after that. They didn't have the heart. "Goofy-looking dog," said the judges. Fat Charlie's father's names for things stuck. That was just how it was. That was far from the worst thing about Fat Charlie's father. There had been, during the years that Fat Charlie was growing up, a number of candidates for the worst thing about his father: his roving eye and equally as adventurous fingers, at least according to the young ladies of the area, who would complain to Fat Charlie's mother, and then there would be trouble; the little black cigarillos, which he called cheroots, which he smoked, the smell of which clung to everything he touched; his fondness for a peculiar shuffling form of tap dancing only ever fashionable, Fat Charlie suspected, for half an hour in Harlem in the 1920s; his total and invincible ignorance about current world affairs, combined with his apparent conviction that sitcoms were half-hour-long insights into the lives and struggles of real people. These, individually, as far as Fat Charlie was concerned, were none of them the worst thing about Fat Charlie's father, although each of them had contributed to the worst thing. The worst thing about Fat Charlie's father was simply this: He was embarrassing. Fat Charlie's father, of course, had elevated this to an art form, and he rejoiced in it, just as he rejoiced in practical jokes, from the simple -- Fat Charlie would never forget the first time he had climbed into an apple-pie bed -- to the unimaginably complex. 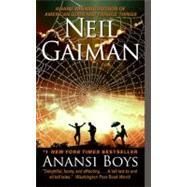 Anansi Boys. Copyright © by Neil Gaiman. Reprinted by permission of HarperCollins Publishers, Inc. All rights reserved. Available now wherever books are sold.